To Change … or not to Change? I already post all assignments on my Computer Lab Wiki and I can set up discussions on the wiki – though I don’t often use the discussion feature and when I have the students don’t seem to really use it effectively. Parents can see what’s happening in the lab on the wiki: both the assignments and completed work that gets posted for each grade. Other teachers can see what we’re doing in the lab and are welcome to use the ideas themselves. I can have students turn in assignments via Dropbox or the online grading program I use – though I to admit that I haven’t used either of these options this year. I can contact students through the online grading program and through the wiki. I haven’t done this often and do admit that students don’t always check these when I do send them a message but would they check anything? I wonder if my desire to use Edmodo (or maybe I should look into Collaborize Classroom, instead?) is more about me and jumping on a bandwagon and trying a new tool than it is about my students. Would my students be more likely to participate in discussions if they were in a more private environment rather than a public one like on our wiki? Would the parents even notice if they couldn’t see all of the assignments anymore? Would it matter to them as long as completed projects were still posted publicly? Should I use this blog or a different wiki to post lesson plan ideas for other teachers and not worry about the fact that every assignment isn’t publicly available? The bigger question for me is would I maintain something else in addition to what I am using with my students? Is the turn in process better with something like Edmodo or not? What would my students or I gain? Would students check messages in Edmodo more than they check messages I currently send? What are the advantages and disadvantages of something like Edmodo over a wiki? What are the advantages and disadvantages of Edmodo over Collaborize Classroom? Would one or both of these tools fit well into a Computer Lab situation? Would it be better to use this with my older students who are already almost all on the popular social media platforms or would it be better to use it as an introduction to social networks for my tween age students? Do you have any answers? Comments? Suggestions? I’d love to hear about your experiences with Edmodo and Collaborize Classroom if you have used these with K-8 (5 year old – 14 year old) students. Published on:May 28, 2011 Category: Reflections 4 Comments on To Change … or not to Change? The first edcamp in California is history and I’m humbled to say I was one of the organizers along with fellow educators Matt Arguello, Chris Bell, Lisa Dabbs, Stephen Davis, Jayme Johnson and Sean Williams and our silent contributors Daniela Bolzmann and Scott Schang. There is no budget for professional development at the school where I teach – the money just has to go to the kids. I don’t let that stop me though and I constantly look for opportunities for PD. So, back in September, when a call went out on Twitter for educators interested in bringing an edcamp to southern California, I added my name to the wiki. I had read blogs and followed edcamp tags on Twitter and been excited by the energy and passion that I had seen in previous edcamps and was excited to be involved. Things got underway and people stepped up to handle the website and the money and the graphics and organizing donations. I really didn’t feel that I was contributing much other than adding my 2¢ in group conversations or Skype calls and posting some Facebook messages. We only had one face-to-face meeting during the planning and only three of us were able to make it. During that face to face meeting, I volunteered to put together the on site sessions board and set up a Google spreadsheet for an online sessions board. I spent some time checking out pictures from edCamp Philly and edCamp NYC and looked at both of the websites for these previous edCamps to see how they handled an online session board. I didn’t find any information on whether these worked well or didn’t work so well. 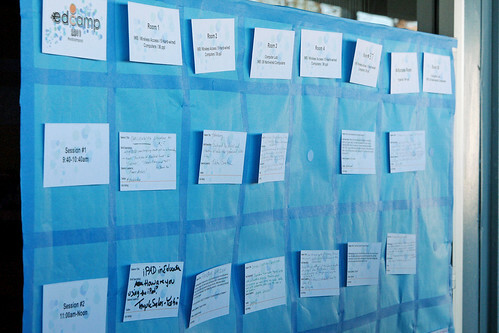 I contacted Ann Oro, who was one of the edCamp NYC organizers, to ask her some logistical questions about the session board and what to expect the day of the event. I was starting to panic that maybe we had forgotten something. Ann was kind enough to Skype with me about it and set my fears to rest. Thanks Ann! I set up our online sessions board grid in a Google spreadsheet and spent some time creating a grid on bulletin board paper using painter’s tape for the squares. I also printed out session cards that people could fill out and velcro to the board in the morning. This seemed to work well and in fact Scott Schang, who attends a lot of BarCamps, said he’d never seen such an organized sessions board. HA! We’re teachers! I can’t take the credit for the idea. I got all of the ideas from the previous edcamps so thank you to them. Speaking of Scott, he set up and maintained the edCamp OC web site for us and did a great job with it. I felt that we needed something more interactive and collaborative that attendees could add to themselves on the day of the event and suggested and set up an edCamp OC wiki for this. 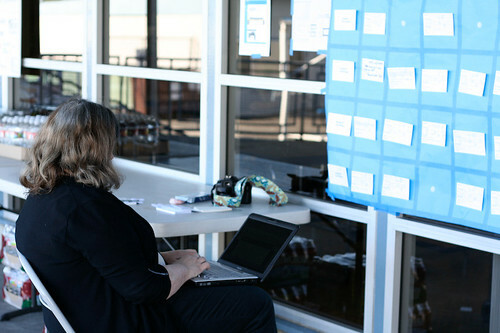 If you were a session leader at edCamp OC, we’d still love to have you add your information to the wiki! The morning of the event was a little crazy trying to get the board up and the session cards out to the registration table and then getting the online sessions board filled out after the sessions were established. However, after the morning rush to get it all set up and going, the day really did run itself. I had been told this would happen and it really did. During the day, I also set up an edCamp OC Contact Form to collect names and contact information from attendees for future conversations and collaborations. This is on the wiki and we’d still love to have anyone who attended add their information to the form so that the conversations that started can continue. It really is possible to organize an event like this without meeting in person until the day of the event – gotta love Google Groups & Skype. People are flexible and will wait for lunch when the catering truck is late – especially if the ice cream truck is already there! Using Facebook pages for connecting with kids is a great way to be where they are but not have to be their friends. Dan Callahan Rocks! It was so awesome that Dan came to the first edcamp in California. The best idea of the day was from the staff of The Children’s School in La Jolla – they brought their students to share in the conversations. I judge a successful conference by how many times I want to be able to clone myself during the day. By that measure, we were successful since that was pretty much every session. Great conversations all day long. I truly enjoy the unconference model for sessions. Learning should be about conversations and I need to remember that in my teaching as well. 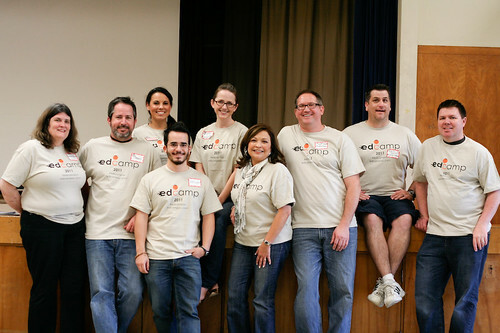 The edCamp OC organizing team are all amazing people. It was truly an honor to work with all of you!